Property Location A stay at Albert At Bay Suite Hotel places you in the heart of Ottawa, walking distance from Library and Archives Canada and Garden of the Provinces and Territories. This eco-friendly hotel is close to Parliament Hill and National Gallery of Canada. Rooms Make yourself at home in one of the 199 air-conditioned rooms featuring kitchens with refrigerators and stovetops. Your pillowtop bed comes with down comforters, and all rooms are furnished with queen sofa beds. Flat-screen televisions with cable programming provide entertainment, while complimentary wireless Internet access keeps you connected. Conveniences include laptop-compatible safes and separate sitting areas, as well as phones with free local calls. Amenities Take advantage of recreation opportunities including a sauna and a fitness center. This hotel also features complimentary wireless Internet access, concierge services, and gift shops/newsstands. Dining Grab a bite from a grocery/convenience store serving guests of Albert At Bay Suite Hotel. Business, Other Amenities Featured amenities include a 24-hour business center, dry cleaning/laundry services, and a 24-hour front desk. Self parking (subject to charges) is available onsite. 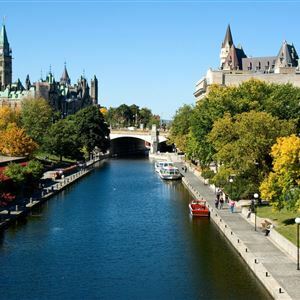 A stay at Albert At Bay Suite Hotel places you in the heart of Ottawa, walking distance from Library and Archives Canada and Garden of the Provinces and Territories. This eco-friendly hotel is close to Parliament Hill and National Gallery of Canada. Make yourself at home in one of the 199 air-conditioned rooms featuring kitchens with refrigerators and stovetops. Your pillowtop bed comes with down comforters, and all rooms are furnished with queen sofa beds. Flat-screen televisions with cable programming provide entertainment, while complimentary wireless Internet access keeps you connected. Conveniences include laptop-compatible safes and separate sitting areas, as well as phones with free local calls. Grab a bite from a grocery/convenience store serving guests of Albert At Bay Suite Hotel.